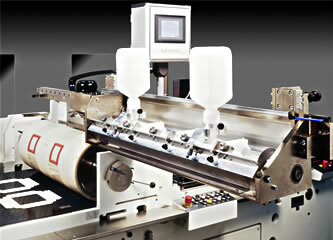 The Universal F1100 Window Machine from Kohmann is simple to operate, yet meets high production requirements. Based on years of experience manufacturing window machines which have become a benchmark in the industry, this high technology machine sets standards for price/production ratio. Compare these productive features to any other window machine and you'll see why the Kohmann Universal F1100 is the most sensible introductory window machine available. The timed belt feeder can work 1-, 2-, or 3-up (3-up is optional). The timed belt feeder with oversized hardened cams gives quiet and fluid movement of the lifters, reducing vibration and extending the life of the cam and cam follower. The lifters are made of light weight material, reducing mass and enabling speed increases up to 15% compared to ordinary belt feeders. The nylon lifters are adjustable both forward and backwards making the feeding of irregular shaped cartons and material very simple. The feed gates with carrier supports have a nip distance of only 15mm (.6 inches) providing perfect carton control enabling higher production speeds. This feeder processes folding carton materials and corrugated materials up to 6mm thick. The automatic air suction control (optional) is carried out by the PLC control of the machine and is programmed via the central input device. Setting the cycle is carried out by inputting the relevant information via the PLC control panel. The drive of the cutting cylinder is carried out by a direct drive, which alters the gearing of the knife cylinder automatically. The chain squaring section features a double spindle system insuring the register chains remain absolutely parallel and ensuring easy set up under all conditions even after years of running. The carton side guides and top guides are made of 5mm solid steel and are designed to remain in shape even after the heaviest jams. The guides are specially treated to protect against wear and corrosion. The rugged, 1/2 inch chain extends the life of the transport chain. Blanks are conveyed from the chain section to the delivery via a vacuum belt and are held without guide bars, enabling optimum access and shorter changeover times. The suction table is split for two stream operation. The doctor blade glue system with adjustable glue dams meters the proper amount of glue and presents it where it's desired. There is no glue sling on chains or cartons due to optimal coverage of the unit and its positioning above the stereo cylinder, which also provides easier access to the chain squaring and transport section. In the event of a missing carton, a pneumatic cylinder lowers the glue counter roller. The glue unit slides out of the machine for quick and easy clean up. There is no glue pan to clean. 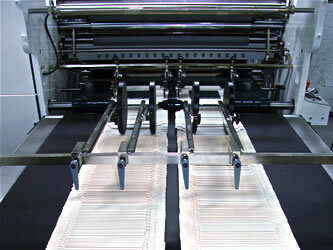 Total clean up can be accomplished in less than ten minutes and glue consumption is dramatically reduced. If one or more blanks are missing, the suction table below the stereo cylinder is lowered automatically to prevent glue from contaminating the suction belts. The stereo cylinder is divided in the middle for two stream operation. The glue application stereos can be prepared outside the machine and then clamped to the stereo cylinder. When a job is finished, the mounted stereo can be stored for repeat orders. Even irregular shaped blanks are easily shingled onto this wide transport belt. The height is variable via hydraulic adjustment. The gap of the shingle is infinitely variable via potentiometer. The delivery can be moved away from the machine to facilitate access to the knife station and for roll changes. The vacuum cylinder is manufactured from a specially treated PA 6 material for longest lifetime. Using synthetic material instead of steel provides protection against corrosion of the cylinder surface and piping system and reduces weight, reducing energy requirements and extending the lifetime of the cylinder bearings. 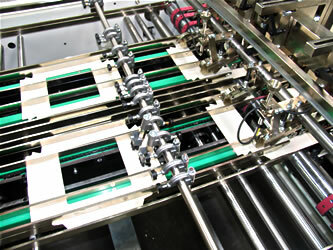 Positioning of the film relative to the carton in the radial direction can be done while the machine is running by means of a handle. The main drive utilizes tooth belts eliminating conventional sprockets, chains and gears. This drive is much smoother, requires no maintenance and eliminates the central lubrication system associated with ordinary drives. Worn chains and stretched chains are a thing of the past. Registration is greatly more consistent. The Kohmann Universal F1100 is fitted with a PLC control. The control makes the operating and monitoring functions much simpler. This comprises the setting of the suction air control for the timed belt feeder, as well as the photocells in front for dust control in the chain section and the lowering of the suction table when missing blanks are detected. A missing film control and double sheet detector can be quoted as optional attachments, which would also be set via the PLC control. Setting of the cut-off length of the window/lining material as well as many more basic parameters are set via the PLC control. The Universal F1100 includes machine self-diagnostics and errors such as open safety doors as well as basic machine operation is explained through clear text and supported by graphic elements. The Kohmann F1100 can be equipped with options designed for specific production requirements. Those options can be included at the time of purchase of can be retrofitted as your production requirements change.